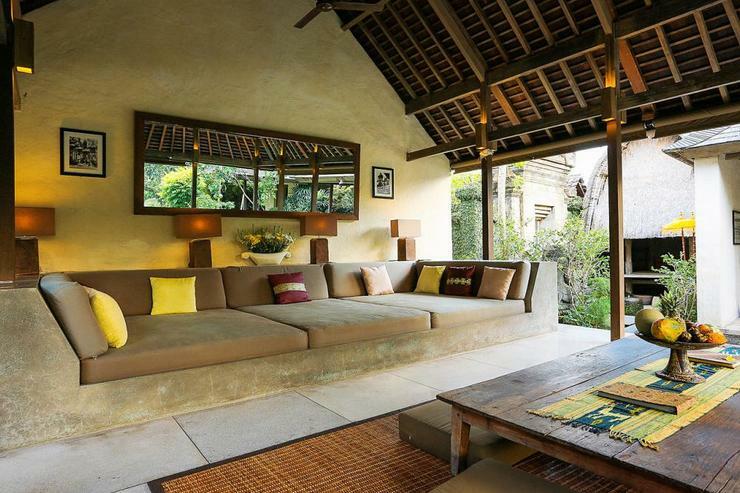 Great for families with kids as villa has two bedrooms, garden space and private pool (with shallow end). One of the bedrooms was right next to the neighbouring property and we were woken all night the first night by barking dogs and crowing roosters (yes roosters crowing in middle of night!). We also felt a bit insecure with our young kids sleeping across the garden away from us so parents may want to bring a baby monitor. We all squeezed in the other bedroom (further away from the neighbour's wall) and slept soundly for the rest of the trip and the noise wasn't a problem anymore. Kids had fun swimming all the time, playing board games in the spacious interiors of the pavilions when it rained , walking round the garden at night with their torch lights looking for frogs and colourful snails! We parents enjoyed very affordable priced massages in the villa, and time to just chill and relax simply because the kids could entertain themselves. We had lots of meals cooked by the in villa chef and they were all excellent and very reasonably priced. Our seafood barbecue at the villa was better than a meal at Jimbaran! The villa is far from most of other places of interest or shops and restaurants (at least 30min drive) but this wasn't a problem for us as we did want a place to stay that was away from it all. 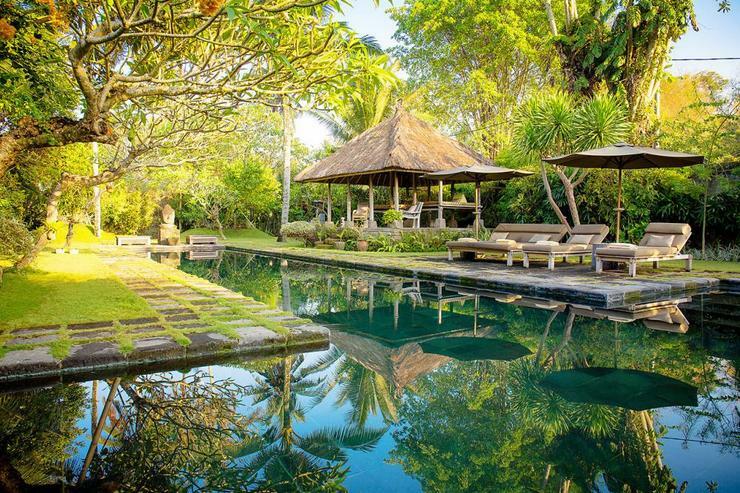 Seseh is a truly quiet and peaceful village and staying there helped us to know the real soul and heart of bali. Cleaniless was kept but I do have to say more could be done for the comfort of the guests, example maintaining the rooms/furnishings/bathrooms better with more thorough cleaning, providing better toiletries, bedroom slippers etc as you can start seeing the age in the property. But others would say it s just the place being so rustic. The staff are kind and attentive and it was nice getting to know them thru chatting with them. They were also very mindful and caring towards the kids. Overall it was a great stay. 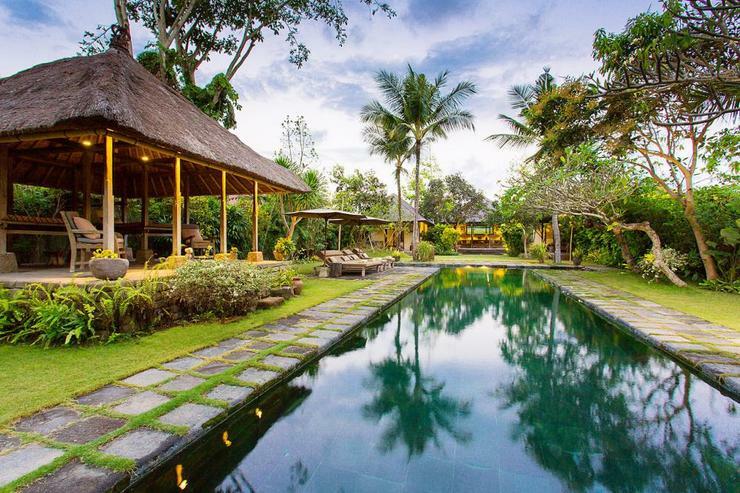 Thank you all at villa belon dua! Villa Belong Dua was amazing. 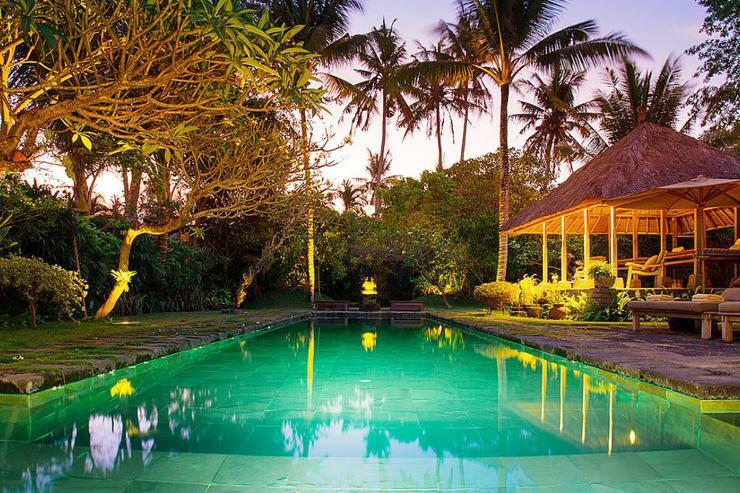 The property grounds are stunning as is the pool area. The day bed is an absolute highlight. We spent hours relaxing on that and it comfortably fit 4 adults and an active 9 month baby. We loved the property so much that we literally didn't leave except to stock up on drinks at the local shop. The food prepared by Frans was delicious and I highly recommend the seafood banquet and local Indonesian dishes. There is one area where I believe there could be improvement. The manager needs to be more pro active in the small things. An example is that we had to request mosquito coils to be set up every single night. I would expect things like this to be done without the guest asking for an elite property like this. I didn't find the roosters and dogs to be too annoying but in saying that we were put in the villa furthest away as we had a baby with us. I highly recommend this property, we would all love to come back in the future. I admit to a degree of trepidation in leaving the known Seminyak for the unknown Seseh, especially as the cab ride ticked up to almost 30 minutes. What if it wasn't what I was hoping for? No need to worry. The second you walk in to the villa you will be amazed. The pictures online look great, but I have to say it looks better in real life and changes throughout the day. I especially liked it from about 3pm when the light became dappled through the tall palms but really, all times of the day had gems somewhere, be it the huge main pavilion or the open shower rooms. It would be a hard judge to not be mightily impressed. The actual buildings themselves are absolutely beautiful and the decor and dressing from art to artefact is done with great and restrained skill. The way pieces are placed steer you subtly to the stairs rather than the garden and guide your eye to interesting items or views. It's really very clever and effective. 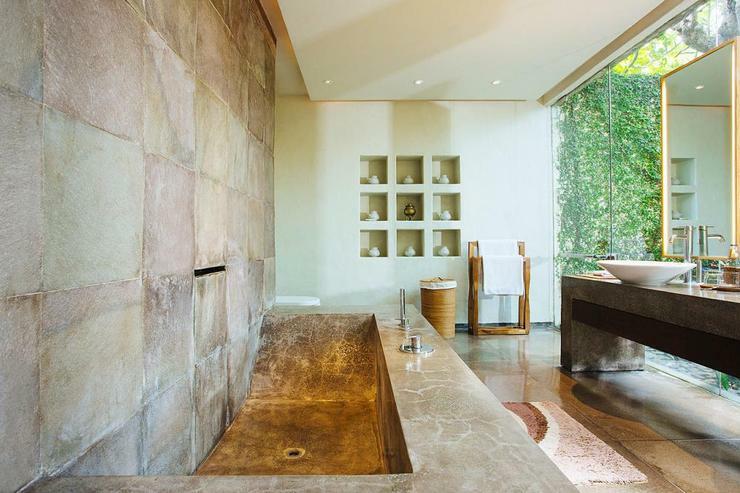 The two sleeping pavilions are absolute luxury with very generous spaces allocated for sleeping, dressing and bathing. The air con, should you want it, is excellent. The villa itself is practically impossible to fault, although travellers should be warned that there is nothing in Seseh aside from three small local shopkeepers who can sell you the absolute basics. You can't eat or drink out that we were aware of. That said, when we needed more Wayan was more than happy to have me dink with him on his motorbike. 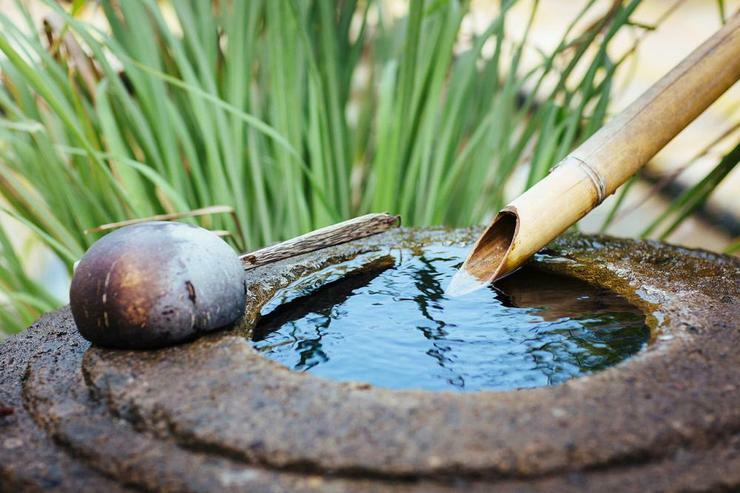 A lovely experience through the fragrant rice paddies. We also walked easily down the beach (at low tide only) to Echo Beach which was a great place for an afternoon refreshment. 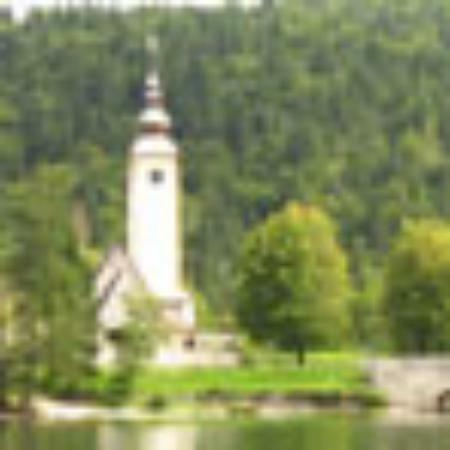 What can be faulted is the service. 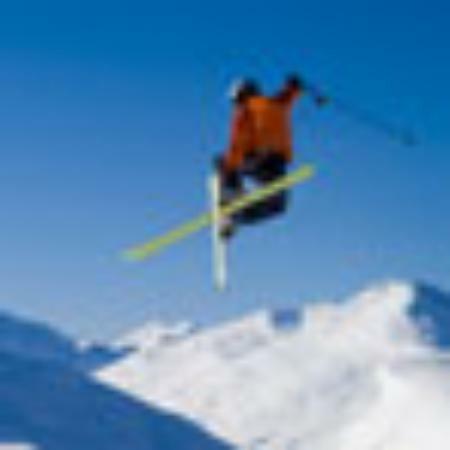 I have seen mixed reviews from other travellers here and I tend to agree with those that find the service odd. 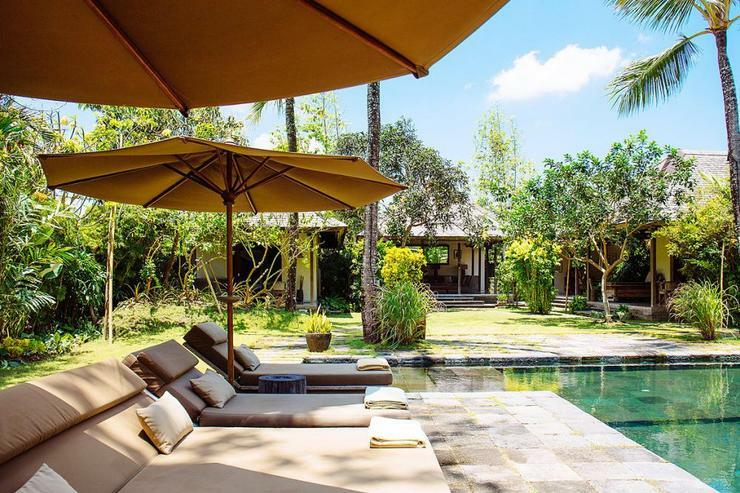 If you are used to the more friendly, smiling, welcoming, proactive, nothing is too much trouble service you get in a lot of Bali villas you may well be disappointed. Some individual staff display this but overall it isn't the tone. We had to ask for most things most of the time and it was us who proactively managed meal times and other services. That isn't to say it wasn't done, it all was and at the first time of asking, but on a hot day if the guests are by the pool and it's 3pm, wouldn't it occur to you to offer them a cool drink? Perhaps more upsetting for some guests might be the small but obvious spats between staff that we witnessed. This didn't bother us that much, but it does create something of an uncomfortable atmosphere at times. I would not ordinarily mention this but as I have seen other reviews reference this it tells me it is an ongoing problem rather than a one-off that I otherwise would have left out. My take on it is it's the manager who I understand to be the owners daughter. I'm not convinced her emphasis is on the guests. I often I felt we were being looked at rather than looked after, and watched rather than watched out for, and that her priority was an almost precious protection of the villa over our enjoyment. In my assessment, it was this that put the rest of the staff on edge. Many positives have been written of Frans cooking and I have to agree with most of it, although you could tell when he was in the mood and when he wasn't. Reheating in the microwave what were delicious fresh pancakes first time around for desert the next night is simply not good enough. Nor is omitting the peanut sauce from the sates just because one night we didn't eat much of it. Really, you can put this under the general patchiness of the service that as a guest you have to manage yourself. Regardless I have rated the villa as excellent as despite having allocated a lot of words to the faults: they weren't that bad and easily qualify as the now cliched 'first world problem'. 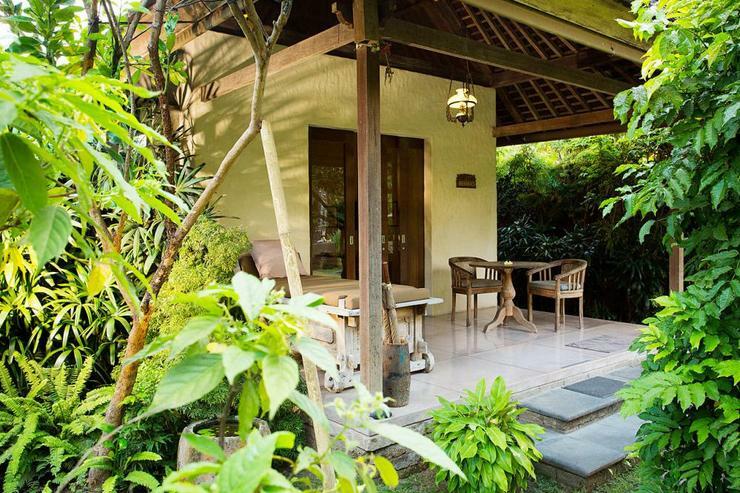 I just think it's important to share with other travellers my experience which is not exactly what you normally get in Bali villas. But I think if you go in with open eyes you won't be disappointed. 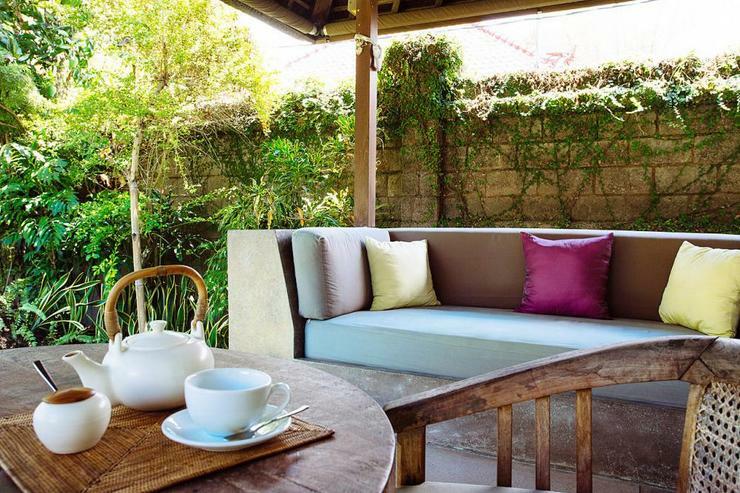 It isn't hard to take on the quasi-management of the villa yourself, you just may not feel you should have to or want to. This is a fantastic villa that is ever so close to being true perfection and I genuinely hope they can iron out some of the management and service issues so it hits the heights the grounds, location and buildings deserve. I am more than happy to be contacted for further information. I did spend 1 week with my family there.. impossible to be disappointed as the villa and the service there is a perfection. the villa is very nice with a perfect design with good proportions. a very nice idea to have a long swimming pool (20 meters) for the ones who really want to swim. 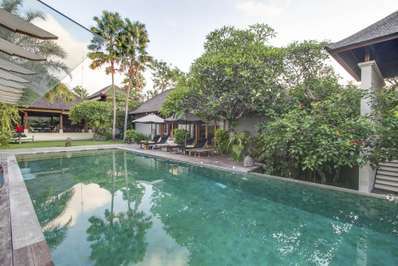 the location is perfect for the one who wants to leave far from the permanent activity of the balnear cities in bali. 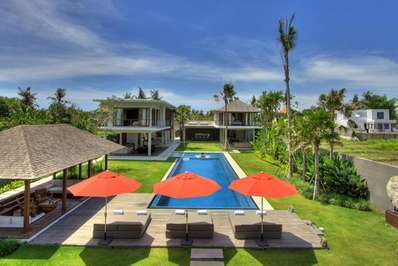 so, it's a nice location and a very good vila, this is something you can get from a lot of villas in Bali. what make the difference then and make this villa so particular and very luxuous.. the people and the details ! 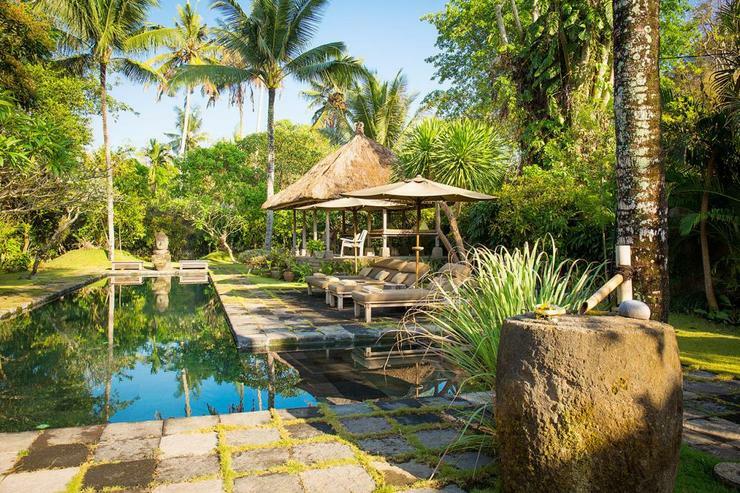 you will have a service team with a level comparable to the service you can get in a luxury hotel and on top you willget the smile of the balinese people ! they will take care of all details in the villa.. and will take care of you all day long. 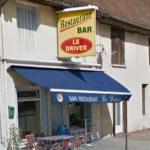 with the exact good distance you will require.. being there when needed, and hidden when you will really want to feel "at home" without anybody around.. a special thanks to Frank (the cook) who has been very professional and even more than that.. you can go there with closed eyes ! just one thing ! please don't book the vila in february we really want to come back next year !!!! 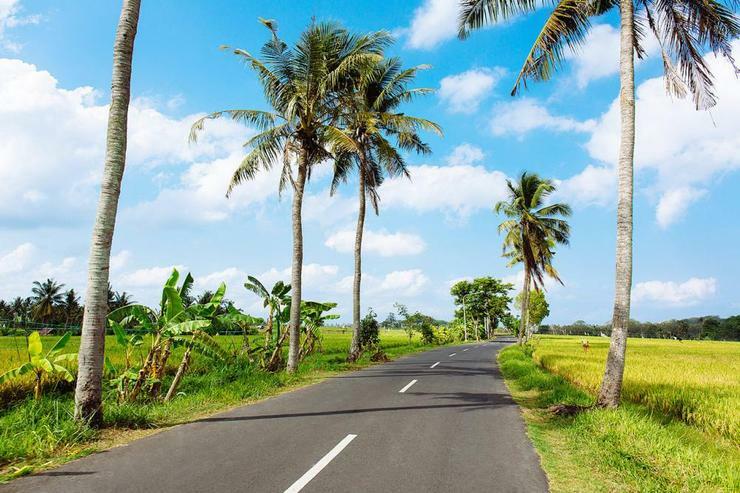 Like many other Australians we stepped foot in Bali again for that cheap sun filled holiday. What we got at Belong Dua was so much more. Seseh is a small village with few cars and amazing culture. We were privileged to be here for Nyepi day, Bali’s day of silence and participated in the celebrations that led to the day. We travelled as a couple plus my mum. 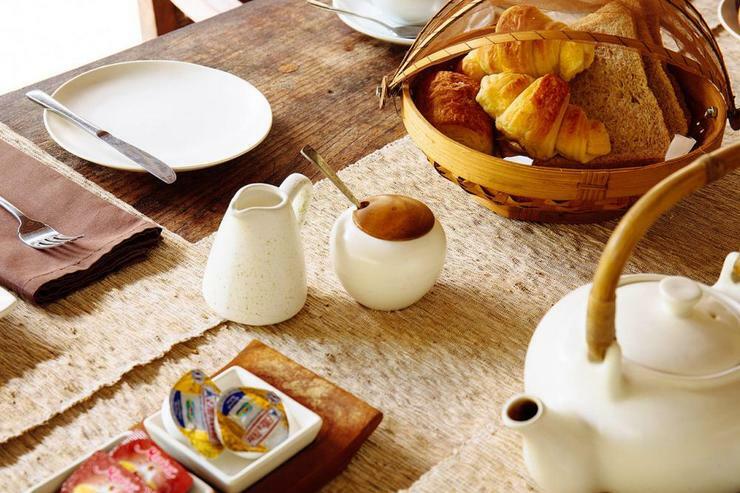 Firstly the staff are spectacular with varying degrees of English and our little Balinese everything we wanted and asked for was provided quickly and without fuss. Puts the chef catered for all types of food and was happy to share all of his secrets with us after each meal. The housekeeping staff were efficient and non intrusive. The grounds are stunning and we were all able to find our favourite books without getting in anyone’s way. The pool was spectacular morning, noon and night. 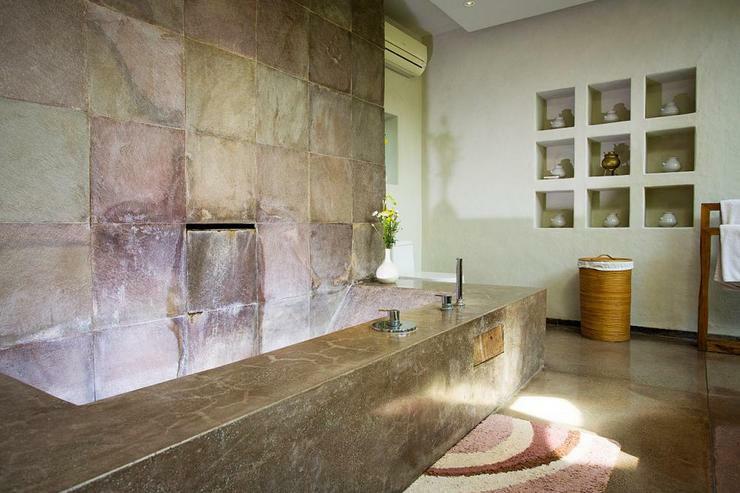 We had spa treatments at the villa almost everyday for a very reasonable price and I suggest ensuing about these the minute you arrive so you can get as many in as possible. Each night a two minute walk to watch the sunset over an almost empty beach was the best way to finish the day. We used the villa bikes and went for aimless walks through the very quiet village but we were all happy just being in the villa. 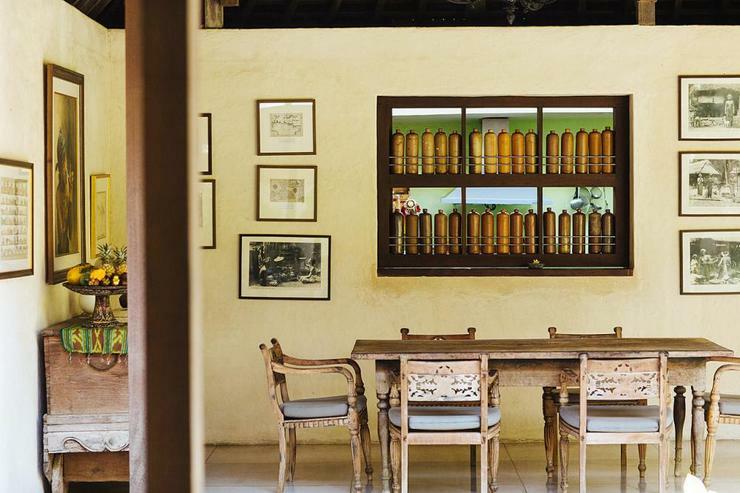 A highlight of our trip was being invited to Nyorman (housekeeper) house for lunch,where we ate traditional foods and explored an area of Bali that tourists and travellers do not see. 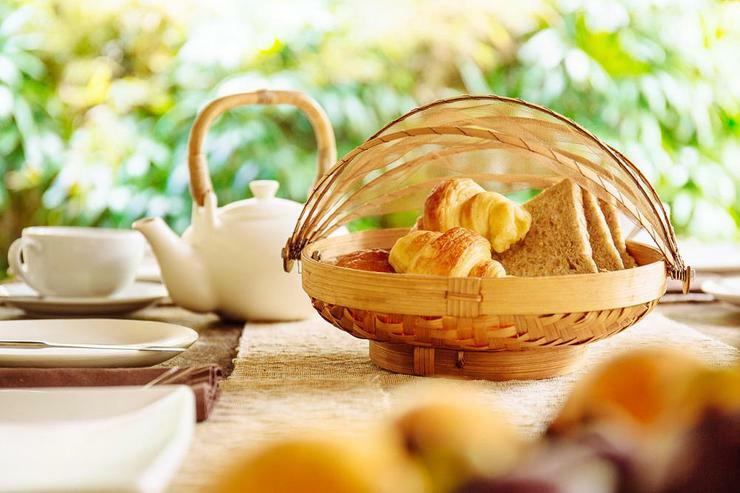 We also were welcomed to the owners villa (not far away) to explore their gardens and rice fields and enjoy afternoon tea. I can’t fault our experience at all, however if like me you are prone to mozzie bites. Between 5:30 and 7 make sure you have some insect repellent on. ( the staff light mozzie coils and fog as well, my mum and husband did not suffer like I did at all and received maybe two bites between them) Questions that I like answered in a review Is it safe? Absolutely, security at night and staff on all day Is it clean? Immaculately Is it easy to communicate? Yes absolutely Just book it. 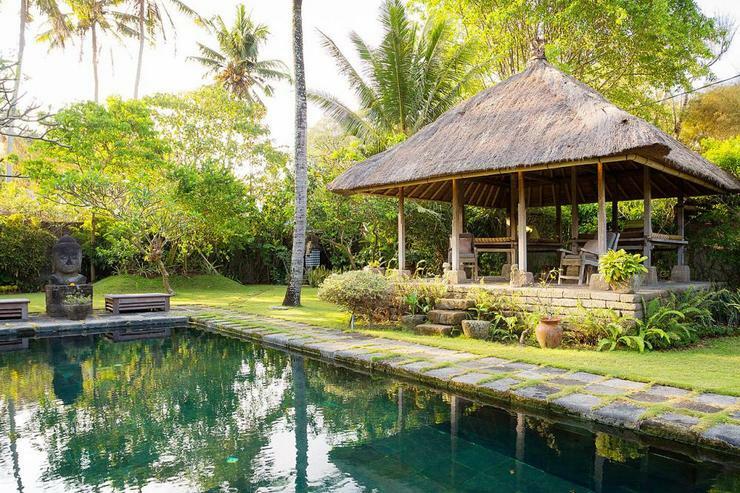 Belong Dua is located in the fishing village of Seseh, which was once a small trading port but today is a favourite with those who wish to enjoy Bali in its rural settings. The village retains its customs and culture and you can see rice being planted and harvested in the fields. 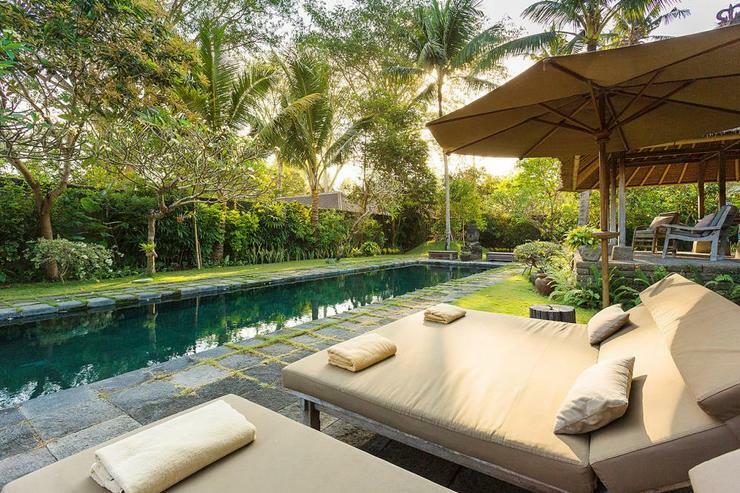 The location is idyllic and away from the crowds yet it is only 30 minutes' drive (15km) from the many restaurants and shops of cosmopolitan Seminyak. 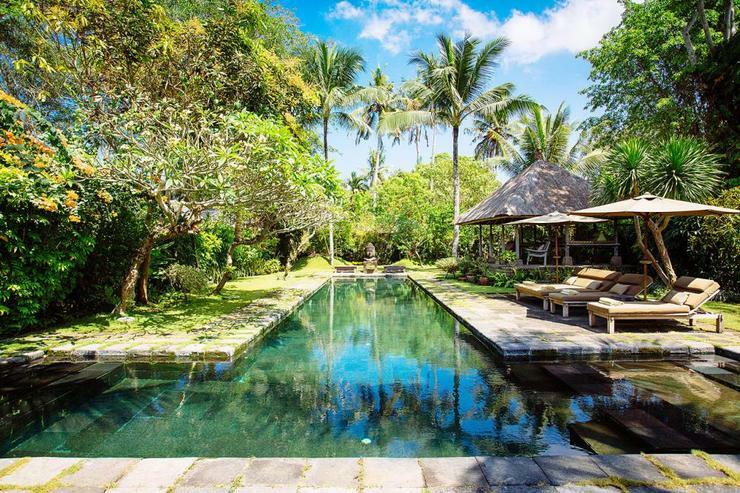 Villa Belong Dua is a charming two-bedroom holiday villa set in the heart of the tiny fishing and temple village of Seseh. 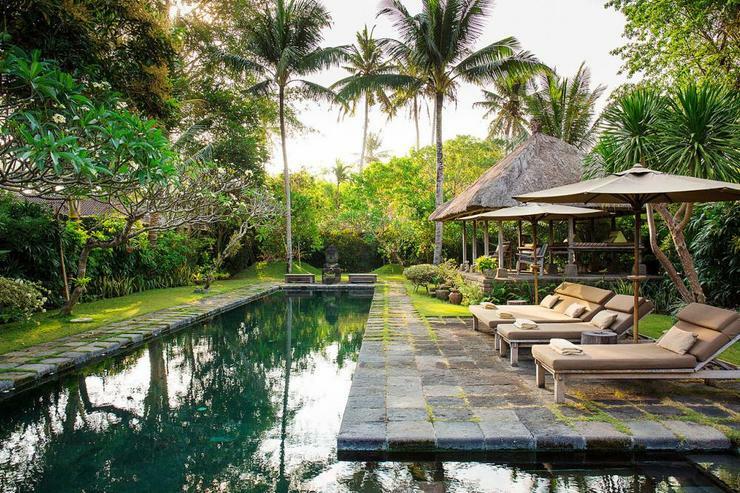 Spread across 1600 square metres of land in a beautiful walled garden, the villa comes with a 20 metre swimming pool and incorporates the symbolic elements of Balinese Hinduism. 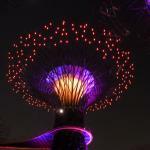 It comprises five stand-alone pavilions positioned in accordance with ancient cosmology. Facilities include WiFi internet access, LCD screen satellite channel TVs and DVD players, and an iPod and three docking stations. 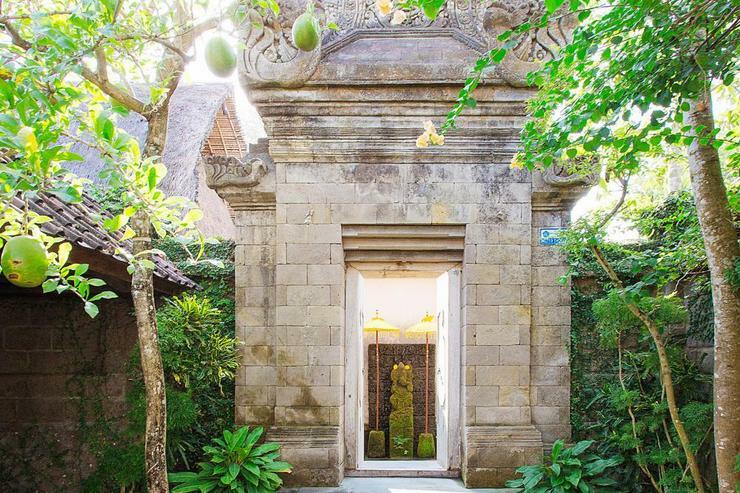 The imposing entrance of Belong villa is a copy of a Hindu temple gate at Angkor Wat in Cambodia. 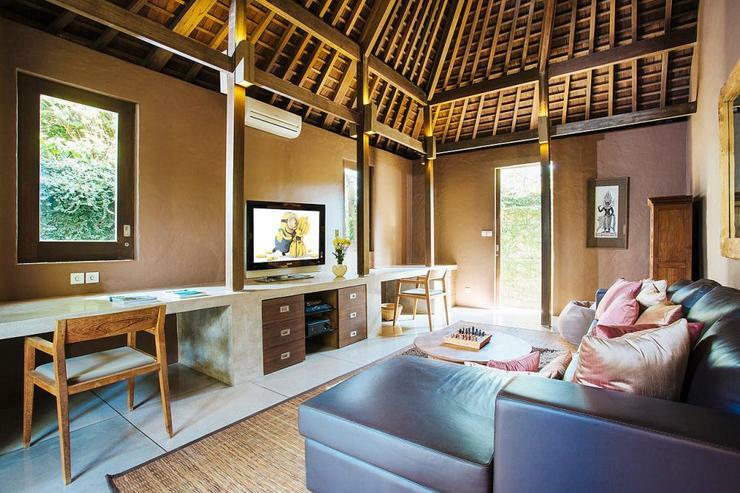 Accommodation includes two bedrooms in stand-alone pavilions named Menaga and Bangkat. 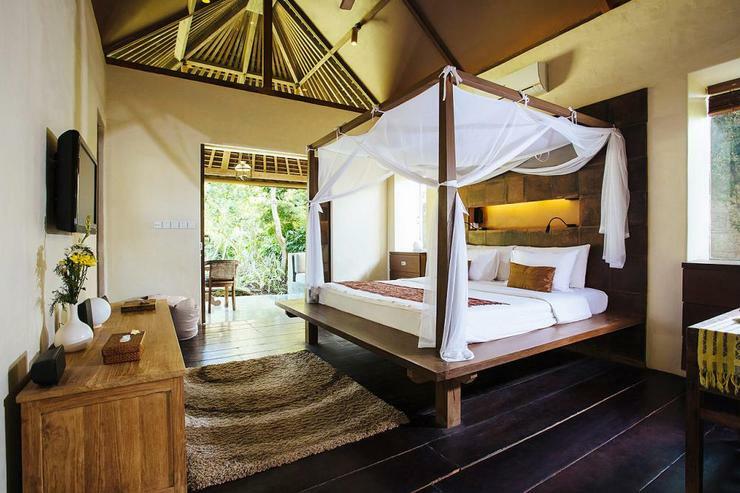 Each bedroom pavilion features a terrace at the front and is furnished with an antique daybed. 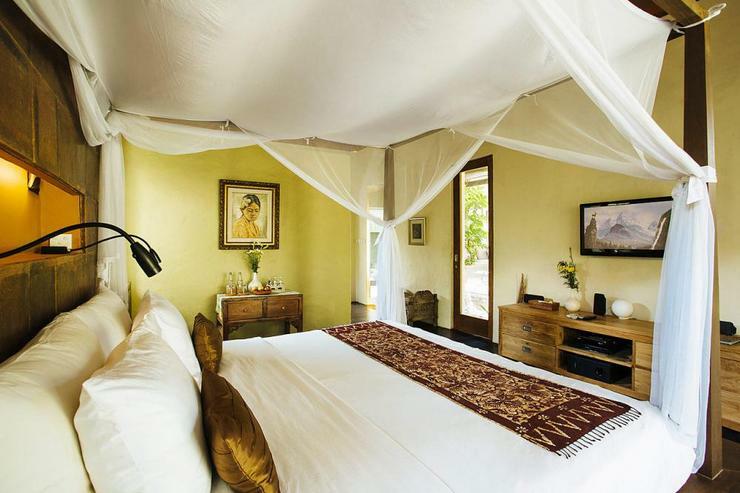 The bedrooms are furnished with a king-size netted four-poster bed and are equipped with a wall-mounted LCD screen satellite-channel TV, DVD player and iPod dock. 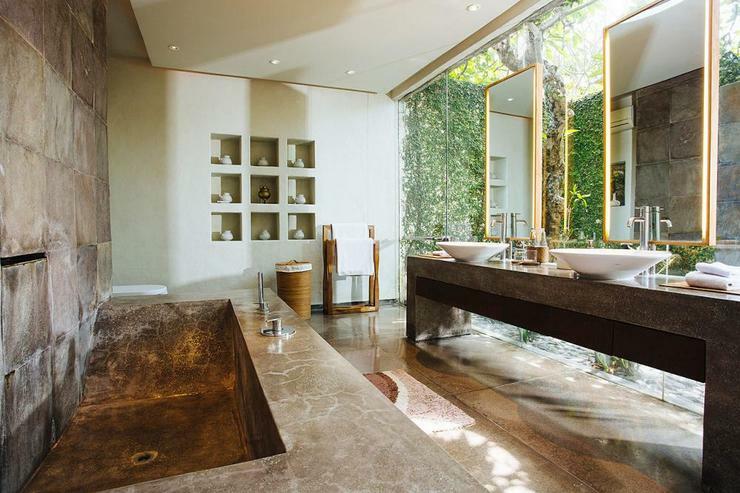 The en-suite bathrooms are fitted with a sculptured terrazzo bathtub and have glass doors that can be opened for a semi-alfresco bathing experience, complete with an outdoor rain shower set in a private walled courtyard. 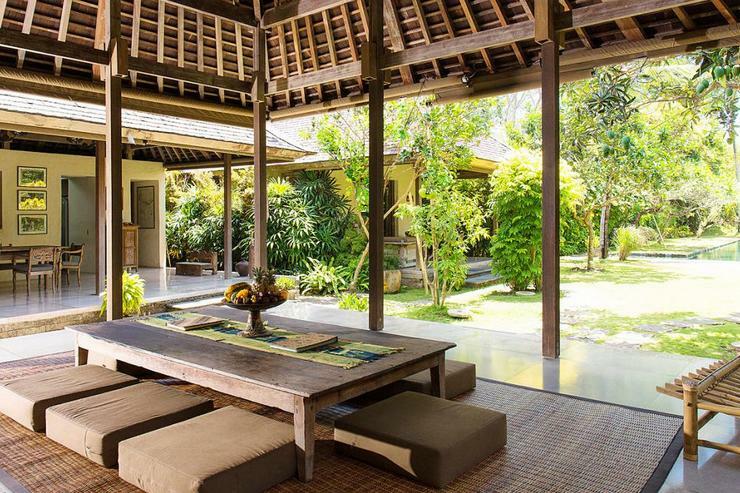 Belong villa also has a traditional open-sided pavilion, which rests besides the swimming pool. 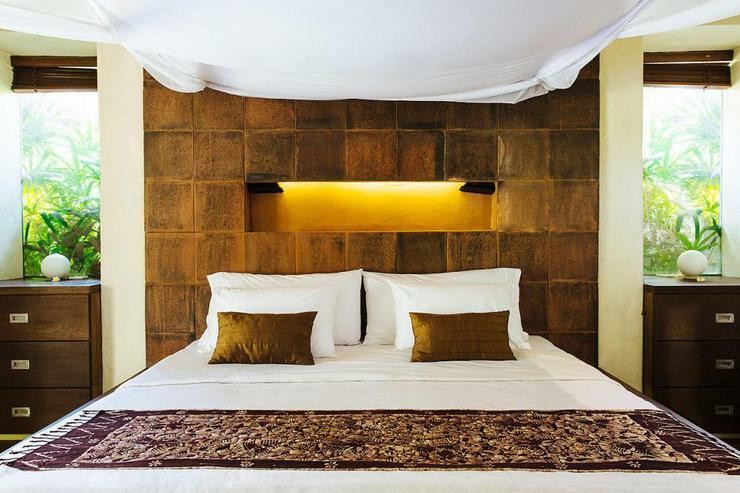 It is furnished with two timber built-in beds and is a perfect spot for couples to enjoy a massage, or just chill out with a good book. 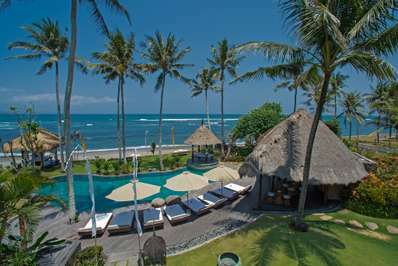 The swimming pool is bordered with a stone deck furnished with one double and two single Sunbrella sun beds. 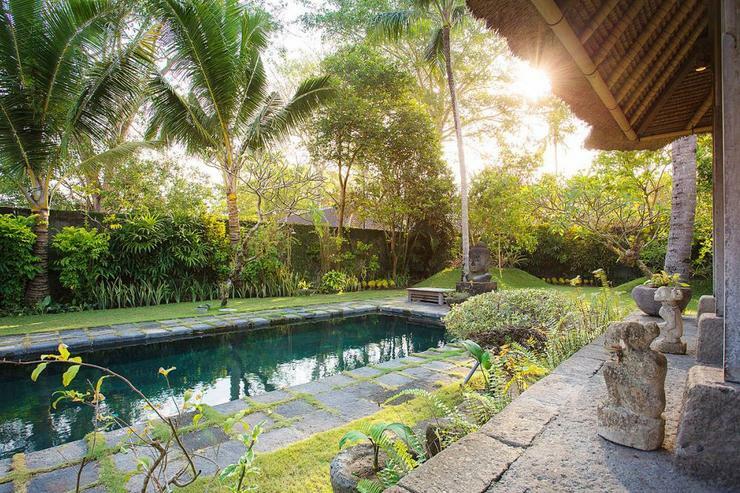 The landscaped garden is accompanied by a velvety lawn planted with coconut palms, frangipani, lemon, and mango trees.